This week, on October 29-30, Scott will be attending the 6th Annual Conference on International Giving, located in Chicago. As much as aid is needed here at home in our own United States, the need for help abroad is so much the greater. Since Interface has been involved with charities all over the globe, Scott has a great first hand perspective on the importance of international giving, and the way to go about it effectively. Watch Larry King Live tonight! 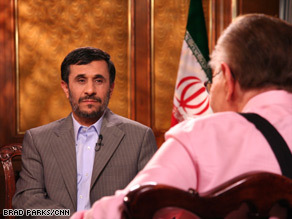 Iranian President Mahmoud Ahmadinejad, one of the world’s most controversial leaders on the fate of the Americans jailed in Iran, and his nation’s nuclear program. After spending the afternoon in Yellowstone National Park & experiencing bison, bull elk & seeing Old Faithful rise into the bluest sky, I feel blessed beyond belief! So as I thought about wildlife & my kids eyes were bulging out of their heads as we drove alongside bison; I thought about Casey & Missi Anderson who run the Montana Grizzly Encounter! 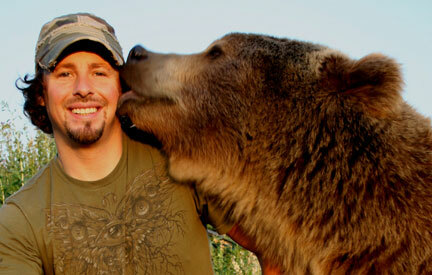 So with fingers crossed my wife, Heidi & our five kids will make it to www.grizzlyencounter.com & meet Brutus! Ekaterina ‘Antoschka’ Moshaeva known as the “Queen of the Clowns’ recently brought together clowns from across the world to pitch laughter as a way to survive the economic crisis. Antoschka is much more than a painted face, she has a diploma in directing from the Moscow Art Theatre School and trained with the Moscow State Circus, where she made over 3,000 perfomances in 35 different countries. 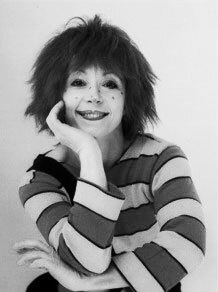 One of a handful of female clowns with international recognition, she is an ambassador for the Yehudi Menuhin Foundation and founding member of the World Wisdom Council of the Club of Budapest International. "All the world loves a clown!" Ken & JJ Ramberg have taken philanthropy to a whole new WWW (World Wide Web) level. Thanks to the the New York-based brother & sister duo, you can give to charity just by searching the Internet. The Rambergs created www.GoodSearch.com, an Internet search engine powered by Yahoo!, which allows users to choose a charity, organization, or school they’d like to support and, with every search, a penny is donated to their cause. Since the site’s launch in 2005, more than 65,000 non profits have registered and GoodSearch recieves 100 new applications a day. Search, search, search on www.GoodSearch.com and make a difference! "If you search or shop online, you can make a difference," said JJ Ramberg who is also the host of MSNBC's, "Your Business". Tags: GoodSearch, Internet Search Enginee, JJ Ramberg, MSNBC, Yahoo! After speaking with our dear friend Anthea Hide in Port Elizabeth, South Africa last night, I was immediately taken back to my 2008 trip to SA & the day I had the honor of meeting Bishop Paul Verryn at the Hide’s Fifth Avenue Inn. I have now been home from South Africa for a few days and think the extraordinary events of my time there are finally sinking in. I am still in awe that my newest hero Bishop Paul Verryn invited me to visit him at the downtown Johannesburg Central Methodist Mission which is considered “home” to over 1,600 Zimbabwean refugees. Bishop Verryn has tirelessly given his love and compassion to find justice for the over 4,000 who have found refugee at one point or another at his Church. Presently over 3 million Zimbabweans have come to South Africa to seek political asylum. 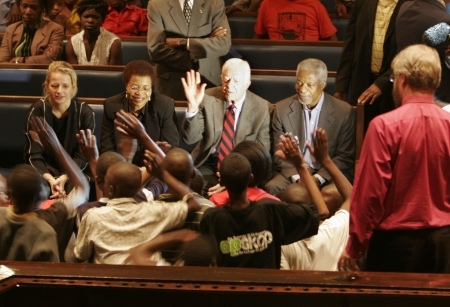 Former United Nations Secretary General, Kofi Annan, former United States president Jimmy Carter, and Graca Machel, an advocate for the rights of women & children, and also wife of Nelson Mandela spent over an hour and a half with some of the Zimbabwean refugees & Bishop Paul. I had the great honor of being present during their visit. Since winning the seat as a Member of Parliament for Richmond Park in the U.K. 2010 general election Zac Goldsmith has not stopped using his voice & influence as a global advocate for the environment. 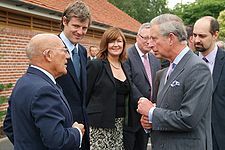 In 2003, Goldsmith, was awarded the Beacon Prize for Young Philanthropist of the Year, and in 2004 he was awarded the Global Green Award for International Environmental Leadership. He then published his book, The Constant Economy, to great acclaim in 2009. While Goldsmith’s new role as a Conservative MP takes him in a new direction, there is no doubt that he will use his platform to increase the profile of environmental issues in the government. Upon meeting my good friend Stephan Bognar, my gut told me this is a man who will change the world & beginning 5 years ago was most definitely changing the philanthropic landscape of Cambodia! For the last several years Stephan has served as the CEO of the Jolie Pitt Foundation & is based in Phnom Penh, Cambodia. Here is a taste of some of the inspiring work Stephan has done & why I feel so lucky to not only have him as a friend, but also a philanthropic mentor. 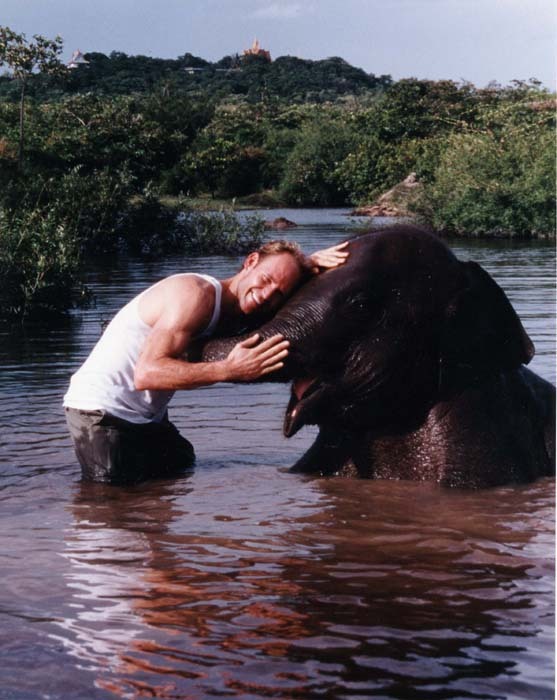 Stephan prior to his position with the Jolie Pitt Foundation was a field agent for the San Francisco-based international non-profit wildlife conservation group, WildAid. Bognar spent two months in Baghdad, where he helped with the effort to rescue and rehabilitate the animals at the Baghdad Zoo. When he arrived, only 32 of the 600 animals remained, the rest were stolen or roaming the streets. The ones left at the zoo were suffering from neglect, malnutrition and dehydration. Bognar helped in the efforts to care for the animals, and to find the lost ones. He also was part of several black market sting operations to recover animals. Bognar also took care of Uday Hussein’s private collection of animals which had been abandoned and which included cheetahs, lions and baby lion cubs. Listen to his NPR interview at: http://www.npr.org/templates/story/story.php?storyId=1290181 and I hope you are as inspired!